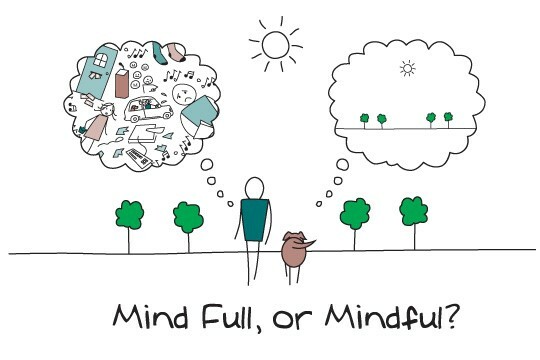 Is you mind full or mindful? A couple of weeks ago we wrote about meditation. How it’s much easier than you could ever have imagined. That you’ve probably being meditating for years in your own unique way without realising it. And why there’s so much more to it than its hippy’ish image would suggest. So, this week, we thought we’d introduce you to another technique. It has similar benefits to meditation but is equally misunderstood. Mindfulness. And if this sounds much too much like more navel gazing, bear with us. You may be surprised by what mindfulness really involves. How it instantly cures one of the most widespread of modern complaints, of time rushing by too quickly. Each day passing by in a blur of activity. Not having enough time to do what we want – or need – to do. Mindfulness is one of the best known of the Zen Buddhist practices. It’s about being fully focussed – and aware – of what you are doing RIGHT NOW. If this sounds far too simple, as though we’re stating the blindingly obvious, just stop and think about it for a moment. Are you focussed 100% on reading this blog? Or are you distracted by all the things you think you need to do today? Or beating yourself up about the things you didn’t do yesterday? Or worrying about the ones you need to do tomorrow? It’s a sad fact of modern life that few people focus ONLY on the present moment. Put 100% of their attention on what is happening RIGHT NOW. On the task in hand. And it doesn’t matter whether it’s large or small. Pleasurable or less so. These days we’re so easily distracted. By all the modern gizmos and gadgets. While we’d like to think they make our lives easier, the stark reality is that they often have exactly the opposite effect. And this includes social media and all the nonsense in the media. Added to this is the modern obsession with being busy, rather than being productive. It’s easy to mistake one for the other but they’re very different beasts. And have you noticed how competitive people are about how busy they are, while no one seems to have noticed that less and less is actually being done? And let’s not forget the ongoing commentary – and snap judgments – most people have running in their heads. This is good – or bad. How could he / she do that? Why did I do this or that? What about the children starving in Africa / Syria / something else? Just think about a car journey you do regularly. How it passes in a blur until the car in front of you brakes suddenly and you’re brought back to the present with a jolt. How you don’t notice a new road sign until someone points it out to you. Or how about thinking about what you did yesterday. How clearly do you remember what you actually did? And we don’t mean simply listing all the things you did, but remembering in detail what you did. You may be surprised by how little you can actually remember. Once you start to be mindful of what you’re doing – and focus 100% on the task in hand – magic things start happening. You instantly feel calmer and more in control of your life. Time slows down. Tasks become much quicker and easier to do. You’ll suddenly notice better ways to do routine tasks and wonder why on earth you hadn’t noticed them before. Suddenly you’re much more productive, rather than being like a hamster on the wheel, busy going nowhere. • Clearer thinking, increased focus and productivity. • Reduced levels of stress and anxiety. • Reduced levels of depression, with clinical trials finding that it’s as effective as medication. • Improved sleep and wellbeing. • Reduced levels of pain, particularly chronic pain. • Improved health and immunity. It’s also helpful in managing ongoing health problems. • Reduced compulsive and addictive tendencies. It’s also been found to help long term weight management and loss. Like any new habit, mindfulness requires a little practice, but is quite easy to do. Choose a trigger to help remind you to bring your focus back to what you’re doing. Checking the time, going through a door, getting into the car. It doesn’t matter what it is, it reminds you to stop and check what you’re doing – how you’re doing it and what you’re feeling at that moment. And then keep your focus on the task in hand for as long as you can. Notice how time suddenly seems to slow down, how much calmer you feel and how much more easily it gets done. Give yourself a pat on the back and be grateful for having done this. A good time to practice is when you’re doing those routine – or boring (!) – tasks. These are the times we tend to “zone out” and let our thoughts drift off to the past or future. But if you stop to think about it for a moment, this is the quickest way to send your head into overdrive. Not to mention letting your productivity plummet. The past is gone, there’s nothing you can do to change it. The future hasn’t arrived yet. So let them be, there’s nothing you can do about them RIGHT NOW. So, like meditation, please don’t be put off by all those preconceptions and hippy’ish nonsense. Mindfulness is nothing like its detractors would have your believe. More and more people are making it part of their lives than you would ever believe, they just don’t talk about it.